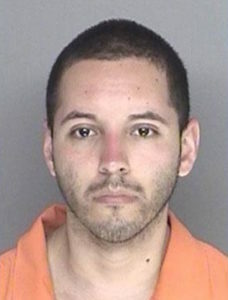 A Lompoc man allegedly killed his younger brother on July 4. Deputies found the 28-year-old victim’s body in a home the two brothers shared with their mother. At about 1:15 p.m. on Monday, Arturo Herrera, 30, reported that his younger brother, Enrique Herrera, was the victim of an assault. Deputies arrived and found the younger brother dead inside his bedroom. The mother of the two men was not home at the time of the incident. Sheriff’s detectives investigated the death, along with personnel from the coroner’s office, Department of Justice and Santa Barbara County District Attorney’s Office. Investigators identified Arturo Herrera as the suspect. Deputies arrested Herrera and booked him in Santa Barbara County Jail on murder charges. Herrera is being held on $1 million bail. An investigation into the case is ongoing. Authorities have not released any details about the manner in which Herrera allegedly killed his brother. This year, there was also a July 4 killing in Santa Maria. A man was killed when a block party ended in a shooting. A male juvenile also suffered multiple bullet wounds during the shooting. Lompuke became Lompton… poor town. Who runs that place, anyway? Did he stab him. Or knock him in the head with a bat? Knives and bats kill people. I am pretty sure I am looking at a photo with dead sociopath eyes again…. Sure… or: he is reflecting on the gravity of what he’s done (allegedly). Perfect timing. The Los Osos CSD has some vacancies. Or he is high on opiates….